The Center for 21st Century Music is delighted to welcome star new music violinist Irvine Arditti back to the June in Buffalo festival. It is difficult to overstate Arditti’s importance in the new music world: he has played a leading role as advocate for the creation of new works for string instruments. Between his activities as violin soloist and his role in founding (in 1974) and leading the Arditti Quartet, he is responsible for commissioning, premiering, and recording countless important works. 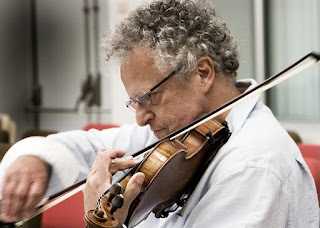 Numerous important violin solos and concerti have been written for Arditti, who has appeared as soloist with distinguished orchestras and ensembles such as the Bavarian Radio Orchestra, BBC Symphony, Berlin Radio Symphony, Royal Concertgebouw, Munich Philharmonic, Orchestre National de Paris, Philharmonia Orchestra, Ensemble Modern, Asko Ensemble, London Sinfonietta, and the Nieuw Ensemble. As leader of the Arditti Quartet, he has received additional accolades. The quartet’s recordings (over 200 albums to date) have received multiple Gramophone (“Grammy”) Awards and Deutsche Schallplattenpreisen, and a Coup de Coeur Prize and Grand Prix from the Academie Charles Cros in 2004; the group has played at most major new music festivals worldwide, and is the only ensemble to receive the Ernst von Siemens Prize for lifetime achievement. Arditti has played a crucial role in reviving composers’ interest in string instruments. In the decades after WWII, interest in strings and in particular the string quartet waned, due in part because of their (negatively perceived) associations with “high” Western culture. This medium may have become obsolete were it not for the advocacy of the Ardittis—alongside the contemporaneous LaSalle, Berner, and Kronos Quartets—in encouraging living composers to write for the medium. Today, the string quartet medium is alive and well, with a vibrant scene of younger string quartets (including June in Buffalo resident ensemble MIVOS Quartet) and an ever-growing and accomplished repertoire of works by living composers of a wide range of aesthetic persuasions. Irvine Arditti and the Arditti Quartet have long been closely connected to UB and the Center for 21st Century Music. The Center’s artistic director, SUNY Distinguished Professor David Felder, wrote all three of his string quartets for the group (the first one dates from 1987-88), who went on to play them at prominent new music festivals worldwide. His latest string quartet, Netivot, written for both the Arditti and JACK Quartets, was premiered by the Ardittis at June in Buffalo 2016. Thanks to the Center’s support, both Irvine Arditti and his quartet have been able to visit June in Buffalo with greatly increased frequency—the quartet was resident ensemble in 2007, 2010, and 2016, while Arditti was guest soloist in 2011, 2013, 2014, 2015, and 2017. At this year’s festival, Irvine Arditti will perform a solo recital of works by senior faculty Roger Reynolds, Hilda Paredes, and Hans Thomalla—all of them long-time Arditti collaborators—on Thursday, June 7 at 7:30pm in Baird Recital Hall. The recital also includes a work by the late Portugese composer Emmanuel Nunes. The following Saturday, June 9, at 7:30pm in Slee Hall, Arditti joins Signal Ensemble to give the second full performance of Center artistic director David Felder’s violin concerto Jeu de Tarot which he premiered at the Center in November with Ensemble Linea.